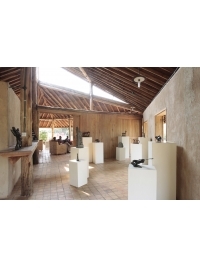 A selection of sculptures is always on show in the gallery. Cast in bronze by Rwenzori Founders or carved in Moroto soapstone and marble, these have been created as a result of workshops and residencies supported by the Ruwenzori Sculpture Foundation. Artists include Jon Buck, David Bwambale, Michael Cooper, Martin Jennings, Isaac Okwir, Peter Oloya and the Karamoja Sculpture Group.